The word "macrobiotic" comes from two Greek words which combine to mean ‘long life’ The diet and its underlying philosophy were created by George Ohsawa, a Japanese teacher and are based on the belief that simplicity is key to optimal health. The original macrobiotic diet is no longer used because it required people to go through 10 ever more restricting dietary patterns ending with a diet consisting only of brown rice and water. Why Is A Macrobiotic Diet Important To Its Followers? Those who follow a macrobiotic diet do so because they want to integrate their own healthy eating into healthy spirituality and a healthy planet. Dietary guidelines are usually personalised to take into account the climate, season, age, gender, activity, and health needs of the individual. A macrobiotic diet should be undertaken with expert guidance as it requires real concentration on balancing food groups. Some dieticians consider it to be lacking in protein and not suitable for long term use. What Makes Up A Macrobiotic Diet? It’s a predominantly vegetarian diet that focuses on whole grains and vegetables and is therefore low fat and high fibre. Most notably, a macrobiotic diet is high in phytoestrogens derived from soya products. This kind of diet is often popular with experts in cancer and other chronic conditions and there is some evidence that phytoestrogens may help protect against and prevent the recurrence of estrogen-related cancers such as breast cancer. This evidence is not yet conclusive, however. The macrobiotic food pyramid is made up of 40 – 60% whole grains by weight. These grains are usually brown rice, millet, barley, whole wheat and oats. These foods are eaten in their most natural states and processed whole grains such as pasta, bread and breakfast cereals are eaten only rarely. Soup is key to the macrobiotic food pyramid and either one or two bowls of soup per day are essential: this soup is either miso and shoyu, Japanese sups made from fermented soybeans to produce the phytoestrogen component of the diet. Vegetables, beans and grains may be added to the soup. Vegetables are between around a quarter of the daily food intake of the macrobiotic food pyramid. Around one-third of these vegetables are eaten raw, with the other two thirds being cooked by the methods of steaming, boiling, baking or – rarely – sautéing. Sea vegetables, such as seaweeds, are also eaten in small volumes – this is most often the Japanese form of seaweed such as nori (most often seen as the wrapping on sushi) and wakame. 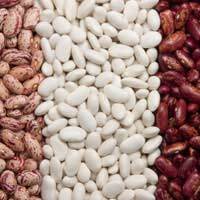 Beans make up 10% of the macrobiotic food pyramid on a daily basis. The beans are either eaten cooked or in the form of soy bean products such as tofu. Macrobiotic diets contain a small amount of fish or seafood which is eaten several times a week. This component comes from white fish and is usually eaten with special condiments such as horseradish (the Japanese form of horseradish is known as wasabi), ginger and mustard which is said to help the body remove the bad effects of seafood from the system. Locally produced fruits can be eaten several times a week too and are usually eaten raw. These fruits, for a Western diet, are apples, pears, peaches, apricots, grapes, berries and melons, but tropical fruits like bananas and pineapples are avoided. The traditional Western dietary components of meat, poultry, eggs, and dairy are usually avoided or eaten, at most, on a monthly basis, while seeds and nuts are eaten in moderation, usually lightly roasted with sea salt or shoyu (soy sauce). The oil used to cook food is always unrefined, one of the most common is dark (unrefined) sesame oil. Corn oil is also used.